With high canola prices relative to other commodities, the temptation to run continuous canola is high. But does it really pay in the short term? A research study shows that net returns aren’t necessarily better, and that insect and disease pressures increase over time. “We have a study that has been going since 2008 looking at the risk of growing continuous canola compared to rotating out of canola for a year or two. We just received funding for another three years so we will have a 12-year rotation study when it is completed,” says Neil Harker, research scientist with Agriculture and Agri-Food Canada (AAFC) in Lacombe, Alta. Harker and colleague Breanne Tidemann summarized research results at Alberta Canola’s 2017 Science-O-Rama. From 2008 to 2016, continuous canola and one- and two-year rotations out of canola were grown at five Western Canada locations. Rotations included continuous Liberty Link canola (LL), continuous Roundup Ready canola (RR), LL/wheat, RR/wheat, LL/pea/barley, RR/pea/barley, lentil/wheat/LL/pea/barley/RR. Fertilizers, herbicides, and insecticides were applied as required. The five sites were in Lacombe and Lethbridge, Alta., and Melfort, Scott and Swift Current, Sask. The crops were direct-seeded on no-till plots. Most fertilizer was side-banded 0.75 to 1.5 inches beside and 1.2 to 1.6 inches below the seed row, with small amounts of nitrogen and phosphorus also placed with crop seeds. Seeding was performed with air seeders equipped with knife openers, and crops were seeded at optimal depths in nine- to 12-inch rows. Blackleg incidence was measured at all sites. Harker says there was a significant decrease in blackleg incidence averaged over all sites when rotations were increased with one or two year breaks in continuous canola. “There was a similar pattern with root maggot. The more years between canola, there were fewer root maggots,” Harker says. 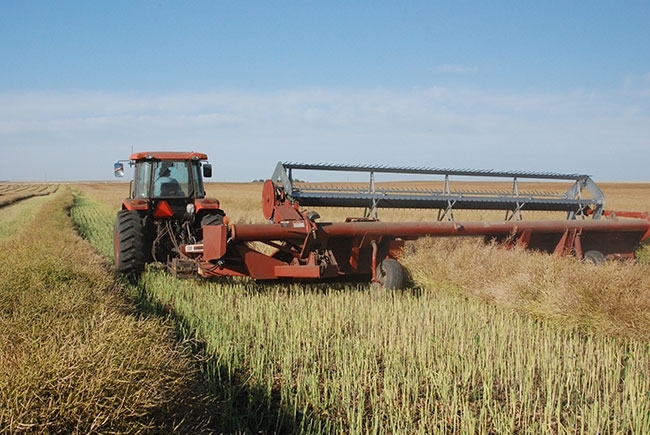 The average yield for continuous canola for all site years was 48.5 bushel per acre. One year out and the yield increased to 53.4 bushels while two years out of canola produced an average yield of 58.3 bushels per acre. One or two years out of canola didn’t always produce higher yield. For example at Lacombe, yield for continuous canola in some years wasn’t always significantly lower. But when averaged across all years, rotating out of canola for one year yielded 3.5 bushels higher, and two years produced seven bushels per acre more than continuous canola at Lacombe. The Melfort site produced interesting results. In 2016, there was a 17-bushel per acre yield increase for each year out of canola – a 34-bushel yield advantage in a three-year rotation compared to continuous canola. On the other hand, 2013 had no significant difference in yield among treatments. But averaged across all years, yields in Melfort still increased 6.3 bushels each year out of canola. Continuous canola or wheat-canola rotations were no better economically. Harker also ran an economic analysis, since growers would say to him that even though yield was higher with one or two year rotations, they still thought the economics would be better with continuous canola. For each year of the study, gross and net returns were estimated using yearly commodity and variable costs as calculated by Saskatchewan Agriculture’s annual Crop Planning Guides. Costs were also broken down by soil zone to more accurately reflect input costs. The results at each site and during each year were variable. During some years more diverse rotations had higher economic returns, while other years no differences were seen. The Lacombe site was an anomaly. Averaged across all years at Lacombe, continuous Liberty Link canola had greater returns compared to one-third of the diverse rotations. However, those diverse rotations included a year of low-yielding peas as a result of unexpected disease, insect pests and weed resistance (Group 2-resistant cleavers). These issues were and will be mitigated in subsequent years. “That was the only site across all years where that happened. Lethbridge and Swift Current were the opposite, where some three year rotations had greater net returns than continuous canola,” Harker says. At Melfort and Scott, economic returns were not different between rotations. 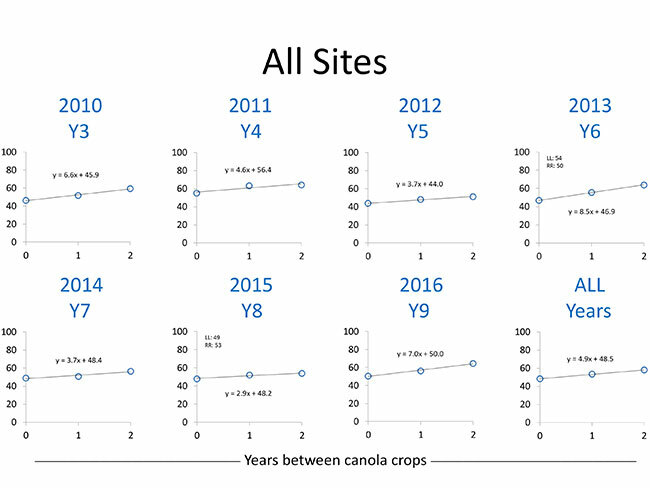 Averaged across all sites and years, nothing was better or worse than continuous canola. The research challenges the notion that continuous canola will provide higher economic returns, and highlights the risks of increased blackleg and root maggot infestations. “The message is that people say ‘I have to grow continuous canola because I get the highest net returns.’ But, we don’t have the evidence for that. Perhaps in Lacombe, continuous canola was better sometimes, but overall that wasn’t the case,” Harker says. As part of the study, the researchers also looked at whether canola hybrid mixtures or rotating between canola hybrids in continuous canola could help overcome increasing blackleg and root maggot pressure. The results from 2008 through 2013 have been summarized. The researchers found that rotating herbicide resistant canola hybrids over the years or mixing two hybrids of the same herbicide-resistant system in continuous canola did not decrease root maggot pressure, or increase yield or seed quality compared to seeding the same herbicide-resistant hybrid each year. “For blackleg, we were probably using the same blackleg resistant genetics in all the varieties because we didn’t know what resistant genes we were using. We were ‘flying blind’ so maybe that’s why there wasn’t a reduction in blackleg disease,” Tidemann explains. In 2014 through 2016, the canola rotation moved to a Liberty Link/Clearfield/Roundup Ready sequence. Some additional agronomic treatments were also set up to try to mitigate yield losses. Fertility treatment at 150 per cent of recommendation, higher seeding rates, tillage, and chaff removal were the additional treatments. Tidemann says the results were variable. In 2014, no treatments increased yield. At Beaverlodge in 2015, there was a response to increased fertility and fungicide application. But averaged across all locations in 2015, none of the treatments could reduce the yield loss from continuous canola. In 2016, rotation with non-canola crops was better than any agronomic treatment.